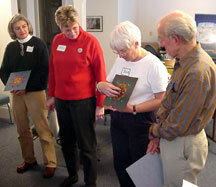 The Mandala Project can provide your group or organization with a workshop tailored to fit your specific needs. From educational workshops designed to teach educators how to utilize the mandala pattern to create lesson plans, to art-making workshops just for fun, we will work with you to provide a stimulating, educational and enjoyable mandala-making experience. Below are basic workshop descriptions for education and general purposes. All workshops begin with a visually stimulating presentation, which can be delivered in either Powerpoint or overhead projector formats, depending on your capabilities. Please contact our Workshop Coordinator, Are House for more information. Using the circle, a universal symbol, you will learn how to pull together subjects in a fun, creative, format that engages students in the adventure of learning. Learn how to combine art with science, math, history, social studies, concepts, virtues and more to create integrated lessons that appeal to all learning styles while meeting state learning requirements. This hands-on class allows teachers to explore their own creativity and experience the fun and relaxing aspects of a rich variety of art materials. Stimulating music, colorful visual displays, and creative brainstorming add to the experience, infusing you with enthusiasm to take back to your classroom. We will share ideas about how to create larger scale projects, which can connect your classroom with other schools, communities and even other countries! Choose from a variety of The Mandala Project's existing lesson plans, or let us design a plan specific to your class needs. Almost all subjects can be incorporated into a mandala art project that will enhance the comprehension of your topic. See the page on Education Workshops to see some of the classes we have facilitated. All workshops are designed to be suitable for use in a public education environments. Depending on the preferences of the group, a mandala workshop can be geared towards spiritual or secular audiences. We have led workshops to commemorate events such as the "Season for Peace" (commemorating the teachings of Mahatma Gandhi and Martin Luther King, Jr) as well as projects specific to personal, spiritual growth. Mandala workshops can also be community-building events in which a variety of people are invited to get together just to share what they have in common, or a project they wish to promote.